I have brought this concept to you before, but it bears repeating. And I swear you will think you're reading a script for the next Terminator movie. But this is all too real; there are men and companies that are pursuing unthinkable things. Ray Kurzweil, the Director of Engineering at Google (just that title should send shivers down your spine) predicts that within 32 years we will be able to upload our minds to computers, thereby making ourselves digitally immortal. What do you imagine God thinks of that? Earlier this summer the U.K. website MailOnline, reported Kurzweil's predictions from the Global Futures 2045 International Congress in New York. This last June the revered futurist also claimed that we are not far away from replacing our flesh and blood body parts with mechanical parts. Combine that with your mind that can live forever in a digital state, and you basically get a robot version of yourself. In the article, Kurzweil says, "Based on conservative estimates of the amount of computation you need to functionally simulate a human brain, we'll be able to expand the scope of our intelligence a billion-fold." He explains this by referring to Moore's Law which states that the power of computing will double, on average, every two years. He bases that prediction on the astounding developments that have taken place in genetic sequencing and 3D printing over just the last few years. In other words, at the rapid rate technology is growing, we will be able to combine the abilities of a computer with God's created human brain, and basically usurp man's natural state and produce a machine that we were never meant to be. 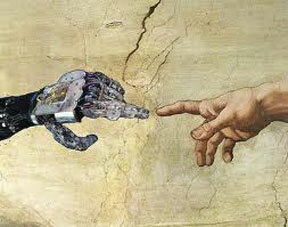 We will no longer be made in the image of God, but in the likeness of a machine-driven computer. We're already seeing it in current medical advances such as cochlear implants and prosthetics. Another example would be technology that can restore motor skills after the nervous system is damaged. While these amazing medical and technological inventions have greatly improved the lives of countless individuals, when it comes to messing with our minds, we are tampering with what makes us distinctly human. We must be careful in going too far and entering into God's territory. A case in point is this scary prognosis by Martine Rothblatt, CEO of a biotech company called United Therapeutics. At this same Global Futures 2045 Congress, she introduced the concept of "mindclones". These are digital versions of humans that can live forever and can create "mindfiles" that are a place to store aspects of our personalities. Ms. Rothblatt said it would run on a kind of software for consciousness and stated, "The first company that develops mindware will have [as much success as] a thousand Googles." Well, based on the current intrusion of Google in our lives, I'm not quite ready to say that development would be a good thing. What about you? Rothblatt added that the presence of mindware could lead to replacing other parts of the body with 'non-biological' parts. In my wild imagination, that could lead to all kinds of chilling scenarios .... Who is in control of these "mindfiles"? Do I want my personality stored "in the Cloud"? And what would keep those in charge from experimenting and interchanging personalities and body parts? It all seems so, I don't know .... maybe Frankenstein-like? Does anybody else think that we could be creating a thing that becomes terrifying or destructive to its maker? In case you think that I am completely way out there in my supposition, just take a look at Ray Kurzweil's forecast: "'We're going to become increasingly non-biological to the point where the non-biological part dominates and the biological part is not important any more. In fact the non-biological part - the machine part - will be so powerful it can completely model and understand the biological part. So even if that biological part went away it wouldn't make any difference." He goes on to say, "We do need a body, our intelligence is directed towards a body; but it doesn't have to be this frail, biological body that is subject to all kinds of failure modes. But I think we'll have a choice of bodies. We'll certainly be routinely changing our parent body through virtual reality and today you can have a different body in something like Second Life, but it's just a picture on the screen. In the future it's not going to be a little picture in a virtual environment you're looking at. It will feel like this is your body and you're in that environment and your body is the virtual body and it can be as realistic as real reality." If that's not enough to send you screaming from the room, listen to this: "We're going to have millions of virtual environments to explore; [so many] that we're going to literally expand our brains. Right now we only have 300 million patterns organised in a grand hierarchy that we create ourselves. But we could make that 300 billion or 300 trillion. The last time we expanded it with the frontal cortex we created language and art and science. Just think of the qualitative leaps that we can't even imagine. 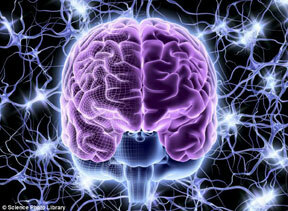 Just think of what could happen when we expand our near cortex again." I don't want to think about it! I don't want to think about any so-called "advanced" version of myself that strips out my soul and spirit; the very connections to my Creator. So I have a question ... just think about what could happen when we give up our mind and personality and the very essence that makes us who we are, and relegate that innate part of us to a machine. If that reality is only 32 years away, then I pray for deliverance from this madness. Isaiah 43:10-11 ".... Before me no god was formed, nor shall there be any after Me. I, I am the Lord, and besides Me there is no Savior."